As you’ve noticed, I’ve been pretty remiss in my blog duties lately. I think I’ve reached a turning point, though, and I’m working my way back to a place where I can fit all the old things I know I enjoy into my new routine. Speaking of routine, and my new job, I was on the news! I don’t say anything in the video, but there’s a bunch of shots of me driving my bus. I happened to be pulling into the garage at just the moment Channel 8 was looking for a bus in which to ride around the block and shoot video. 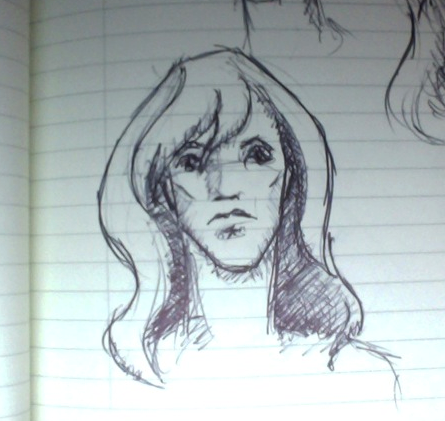 I drew this sketch of Vanya yesterday (featured at end of post). A few days ago, I began playing the harp again after a truly intolerable break (I think it was a whole month). Soon, I’ll start re-working Wanderlust again. Lady Higg gave me a lot of things to think about in her Wanderlust review, and right now I’m not quite sure in which direction to take things, and how far to go. These are problems I’m going to have to attack pretty soon. Maybe this weekend. I’ll tell you more when I can. I hope you’re all enjoying yourselves this independence day; I’m certainly looking forward to the fireworks tonight. I found out last week that it’s really hard to do multiple blog posts in a week, especially if that week is one of the few leading up to Christmas. I owe you a review of The Hobbit movie. Perhaps later? Or maybe I will just say this: the things in this movie that were good were really good. In several ways it exceeded my expectations. The things that were not good about this movie, though, were really not good, and for me these things rendered the movie less than a success overall. If you were not bothered by the things that bothered me or were able to set them aside more readily, I am happy for you, and since I’d really hate to ruin the experience for someone else I’m not going to get into any specifics here. I’ve been stressed out about getting everything ready for the holidays and saving up for my first student loan payment (due three days after Christmas). It’s getting in the way of the writing; I haven’t moved forward on Wanderlust in a number of days. I did write 700 words of the first chapter of Wanderlust Book Two last night, though, so I’ve been thinking about the characters. I haven’t told anyone about that Book Two opening scene yet. I’m worried it’s too dark, but I’ve been playing with it for months and it feels really true to the characters and true to the tone I’m trying to set for a second book. Not that I’m even working on Book Two yet—just letting it bump around in my subconscience and dashing down ideas as they come. Eventually we’ll see how it all plays out. 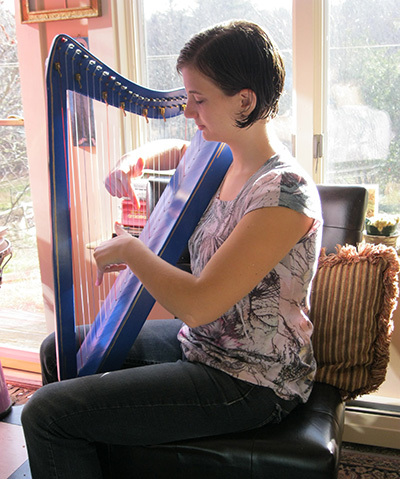 Harp lessons are still going really well; I’ve had three now. I’m working on a lot of stuff and getting better every day. I’ve even played at a few open mics, which was fun and nerve-wracking. How do all these guys with guitars regularly play stuff and sing at the same time? Oh, I bet they’ve been playing their instrument for more than a month. That must have something to do with it. I’m impatient to learn more things and get my own harp and play better and faster, but at the same time I love every minute of playing exercises and chords and even just holding the thing as I tune it (and it’s even holding a tune better than it did when I first got it). About a week ago practicing the harp did begin to feel like work, because I was frustrated on a couple of my pieces and also my hand hurt from doing something else and I was worried that harping would make it worse. This thing, where little things get in the way and make it hard to keep going, is something I recognize from every other instrument I’ve ever tried to play. And yes, I didn’t practice for two days in a row this weekend. 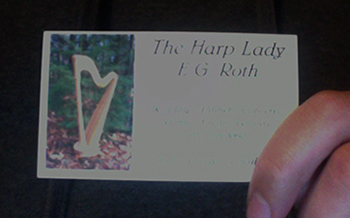 But then I did practice and I worked through it and I still love the harp and the sound of it and everything about it. I really think I’ve finally found my instrument, and that I won’t be putting it aside anytime soon. Hopefully I’ll update again before the 25th, but in case I don’t, I wish you a very Merry Christmas, and I hope you and your family have a delightful holiday season.